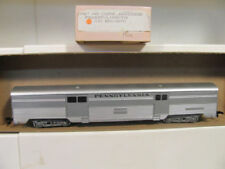 CON-COR HO Scale California Zephyer Passenger Car w Free ship! VIA Rail Dome Obs Car. Condition is New. Shipped with USPS Priority Mail. Ho Scale Train 3 Car Lot. Con-Cor Durango & Silverton cars Nice Shape in Boxes. Condition is Used. Shipped with USPS Priority Mail Medium Flat Rate Box. Here is a Con-Cor 0003-570015 Lackawanna Six Car Heavyweight Passenger Cars (Set of 6). Please see my pictures for additional features, and to view all included items. This item has been graded per TCA standards C-7: Excellent. There are a few light scratches on these items. The instruction manual is not included. The original box is included. Overall condition is Excellent. Manufacturer: Con-Cor. Model Number: 0003-570015. Road Name: Lackawanna. Scale/Era: HO Modern. Model Type: Passenger Cars. Availability: Ships in 1 Business Day!. # 32 00 9 Coach. # #3 40 29 Coach. Fi rs t, I l is te d th em as P ha se 3 b ut t ha t is a g ue ss o n my part. # 31 04 8 Co ac h Ba gg ag e. #3 30 21 C af e Lounge. # 38 01 5 Di ni ng C ar. 1930’s-Present era “HO” 85 Ft Streamline Corrugated Passenger Cars. This is one of my original Cars been in service at least 10 year probably more. A little paint and new parts. Doug - Model Train Market. Old Con-Cor Roco No. NEW YORK CENTRAL NYC. Pictures show both sides of car. Handling covers the cost of boxes, bubble wrap, labels, ink, paper, etc. My schedule may vary. HO SCALE CON-COR 72 FT Observation Car B & O PULLMAN. Condition is Gently used. Shipped with USPS First class Mail. 2 Con-Cor Passenger Cars New York Central Diner, Corrugated Side Southern Rwy. Both of these look to be in great condition. 1- Roundhouse - ACL Caboose 3402. 1- Athearn - Atlantic Coast Line GP-35 Dummy engine kit. Circa 1990's. Con-Cor HO-Scale Train Bluebird International Camp Woebegon School Bus Herpa NIB. Condition is New. Comes with side mirrors to add on. Comes in the original box. CON-COR HO AMTRAK SLEEPER AND SIGHTSEER LOUNGE PHASE IV NEED ONE COUPLER. 85 FT Streamline Corrugated Passenger Cars. HO 85 Ft Pullman Standard Corrugated Coach. "HO" BCS Branchline 1920-1950's Heavyweight Pass Cars. HO 85 Ft Pullman Standard Dining Car. "HO" Scale Models. HO SCALE CON-COR 72 FT Diner SOUTHERN RWY PULLMAN. Condition is Gently used. Shipped with USPS First class Mail. Use with Kadee or Horn Hook Couplers. Wheel trucks can be moved around. De Chihuahua #251. 10-6 Sleeper: CH-P, Cd. de los Mochis #227. Plastic windows. HO SCALE CON-COR 72 FT Railway Post Office (RPO)/Baggage SOUTHERN RWY PULLMAN. Condition is Gently used. Shipped with USPS First class Mail. The famous PRR “MuMP54 powered “MU” cars were built off similar plans when the PRR started to Electrify about 1915. Coach Car and Combine Car. “HO” Models are scaled from 65 Ft long cars. (Full scale 85 ft long cars as made by other manufacturers need at. ). Condition is New. This train is N scale, category shows HO and I tried to change this but is locked. SANTA FE 3 CAR PASSENGER TRAIN. H.O. GAUGE EXCELLENT.CONDITION. This sale is for a 3 streamlie passenger car Santa Fe passenger train with Santa Fe diesel locomotive. One Tyco Santa Fe EMD- F7 diesel locomotive. It has a bright headlight. It will haul many cars. Con- Cor HO scale Amtrak Superliner Sightseer Lounge Ca. 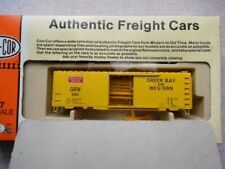 CON-COR HO U/A "NEW YORK CENTRAL" 8 CAR CORRUGATED SIDES PASSENGER SET. Condition is lightly used and in original boxes. 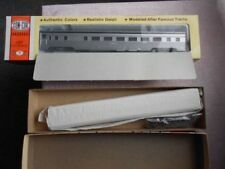 HERE IS A RARE, OLD RUN, OUT OF PRODUCTION, CON-COR, HO SCALE, UNASSEMBLED NEW YORK CENTRAL 8 CAR CORRUGATED SIDES PASSENGER SET. THIS 8 CAR CORRUGATED SIDES PASSENGER SET INCLUDES: 85' OBSERVATION, 85' DINER, 70' BAGGAGE, 85' COACH, 85' COACH, 85' 10/6 PULLMAN, 85' SLUMBER COACH AND 70' BAGGAGE CAR. THIS 8 CAR CORRUGATED SIDES PASSENGER SET. Original Box. LIKE NEW CONDITION. (1) HO ConCor BALTIMORE & OHIO Streamlined Baggage Passenger Car B&O #1313. 10-6 Sleeper: CH-P, Cd. de los Mochis #227. de Chihuahua #251. Plastic windows. 10-6 Sleeper: CH-P, Cd. de los Mochis #227. de Chihuahua #251. OBS F.C CH-P. Juarez #605. 10-6 Sleeper: CH-P, Cd. de los Mochis #227. de Chihuahua #251. CON-COR HO SCALE AMTRAK NON ILLUMINATED PASSENGER CARS WITH BOXES. ConCor 094713-01. Northern Pacific "Pine Tree". 72' Passenger Tail Car. (3)#2905 City Of Monon Pullman Car. The models are in the original Con Cor Boxes. The wheels and trucks will have to be attached. 4)#6601 West Baden Springs Dining Car. 3)#2904 City Of Lafayette Pullman Car. ConCor 094714-1. 72' Passenger Sleeper Car. Northern Pacific "Pine Tree". Up for sale is a Con-Cor SEPTA MUmP54 Commuter Set. Set consists of (1) DCC ready powered car and (3) non-powered trailers. Set is lightly used, locomotive runs with no issues and all the cars do not have any broken or missing parts. 85 FT Streamline Corrugated Passenger Cars. HO 85 Ft Pullman Standard Corrugated Coach. HO 85 Ft Budd Built Slumber Coach Car. HO 85 Ft Pullman Standard Dining Car. HO 70 Ft Pullman Standard Corrugated Baggage.